Hi everyone! I'm back! 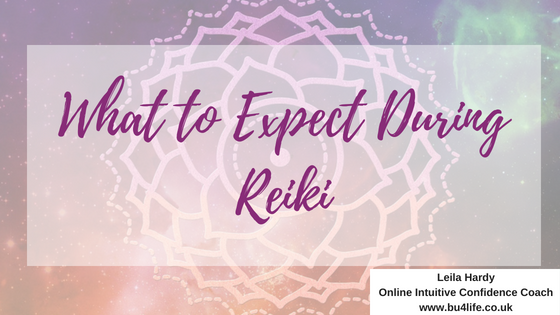 Today, I'm blogging about what to expect during a Reiki Session. You can catch up of the series of Reiki, energy and intuition blogs so far by visiting 'previous' after you've read this! Other than the obvious benefits of relaxation and stress relief during a Reiki session, there are so many other benefits and experiences you may have during a Reiki session. Now I must add here, that everyone is different, so everyone who has a Reiki session, will most likely experience something unique to them. For you to find out what you can expect during a Reiki session, you can contact me here to experience a session for yourself with one of the incredible Reiki practitioners who have been through my Reiki courses. When emotional, mental or physical energy blocks are released during Reiki, sometimes the person will feel a cold sensation. When a block is broken down, melted or burned up, a hot sensation may be experienced; either in the area of the block, or all through the body. As the Reiki is received, often the person receiving the Reiki may twitch or notice sensations in various places around their body. This indicates a flow of energy from a block, or simply an increase of flow. Occasionally, especially when working with any health challenges, alongside any medical intervention, over a longer period of time, someone receiving Reiki may notice slight discomfort just as the Reiki is moving to that particular area of the body. This in most situations, only occurs once, as the life energy is then flowing afterwards. Reiki has the power, to help you connect with your intuition, identify your psychic abilities and enhancing and amplify them. Some people during Reiki may see, sense or feel; colours, images, words, even faces and people. When this is embraced as part of your spiritual wisdom and life energy, there is so much to be gained by meeting and learning about your own spiritual guides that supporting you throughout your life. What have you seen, sensed or felt during Reiki? Do share in the comments! I'll see you in a couple of days for the next blog all about energy, intuition and Reiki energy healing! If you're enjoying these, let me know in the comments!